Green and purple are the official colours of Collège Boréal. The green reflects the importance of the forest for the people of northern Ontario, where the college was founded, and the green shift it has recently made. The white represents the various minerals found in Ontario, particularly silver, nickel and diamonds. Green and white, the official colours of francophone Ontario, symbolize the close ties between the college and the Franco-Ontarian community. The fleurs-de-lis illustrate the French origins of the first Franco-Ontarian settlers and the ties between Collège Boréal and the international francophone community. The trillium is the floral emblem of Ontario. The aurora borealis, represented in the shield with a radiated pattern, evokes the name of the college. The fifteen rays of the aurora borealis represent the eleven communities in northern Ontario responsible for its founding and the four regions in central and southern Ontario now served by the college. The black spruce represents forestry and silviculture, two important programs at Collège Boréal. It is also the symbol of the boreal forest, which, along with the aurora borealis in the background, reflects the name of the college. The spruce also suggests knowledge and the students’ personal growth, as Aboriginal people consider it the tree of life and knowledge. The book is a symbol of the college’s educational mission. 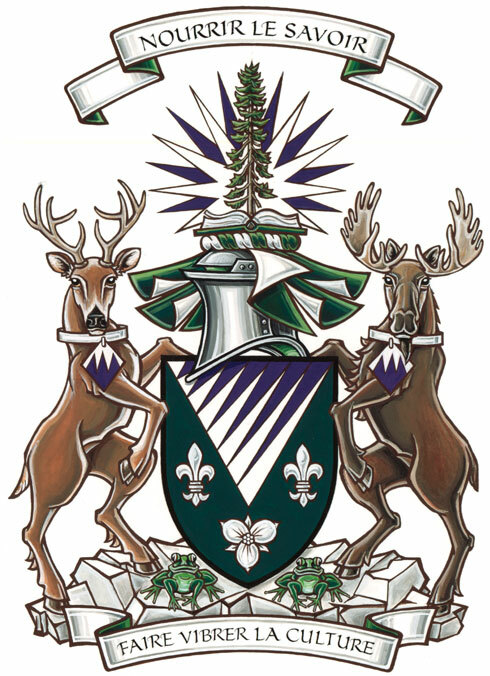 The moose represents northern Ontario, where the college was founded, and the Métis nation, which created strong ties with the learning institution. The deer represents central and southern Ontario, regions now served by the college. The lozenges illustrate the various minerals found in the soil of the province. The compartment evokes the Canadian Shield. The college adopted the frog, a well-known symbol among Franco-Ontarians, to represent its green shift. Meaning “Nurture knowledge” and “Make culture flourish”, the mottoes demonstrate how important education and culture are to Collège Boréal.